Head into this little collection expecting something along the lines of the regulation Dr John and you’ll more than likely be disappointed. Not that there’s actually a single recognisable entity you can clearly label Dr John once you remove the characteristic Rebennack drawl from the mix, but if you’re looking for the something in the familiar New Orleans seventies fonk groove, you won’t find too much of it here. Some pretty good R&B tinged rock’n’roll, sure, but light on for the fonk. 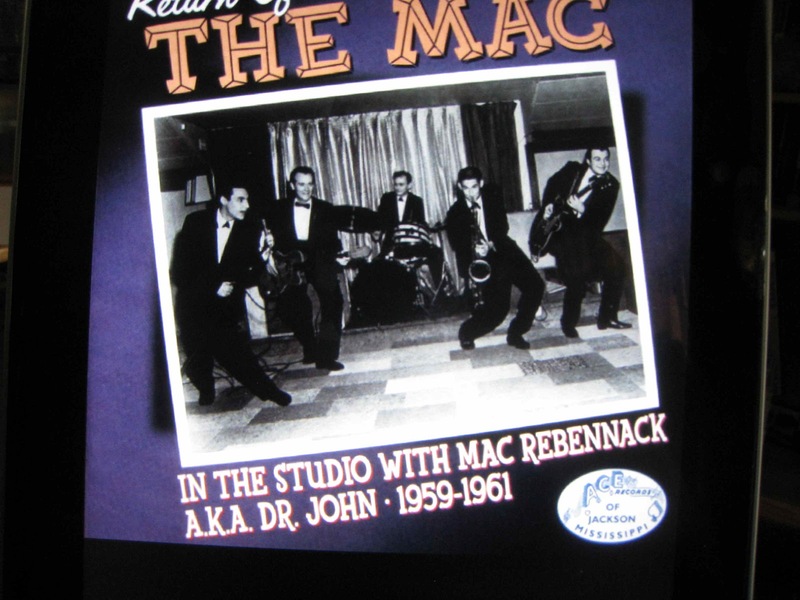 When Rebennack dropped out of Jesuit High School in New Orleans in 1955 he already had around a year’s involvement in the New Orleans music scene as a member of the Spades (later the Night Trains). He’d been taught guitar by Walter 'Papoose' Nelson and Roy Montrell, both of whom played guitar with Fats Domino and went on to die of drug overdoses. Rebennack, of course, had a lengthy involvement with narcotics. He had, however, started writing songs with Leonard James of the Spades, and later with Seth David and had started to pick up the occasional sideman gig at Cosimo Matassa's studio before he was tempted over to Johnny Vincent’s Ace Records as a session muso and producer for the not-inconsiderable sum of of $150 a week in 1957. The gig gave him the opportunity to work with Huey 'Piano' Smith, Joe Tex, Jimmy Clanton and Frankie Ford, and by the end of the decade he’d been accepted as a peer by the likes of Lee Allen and Red Tyler, something that had a fair degree of bearing on his later career. Kicking off with five instrumentals credited to Mac Rebennack (Storm Warning (Long Version), Foolish Little Girl, Good Times, Sahara, Feedbag and South Of The Border Town) all of which rock along pleasantly enough without doing anything to attract your undivided attention the vocal contributions kick off with Ronnie And The Delinquents’ Bad Neighbourhood (a little essay on the petty side of juvenile delinquency) and veer off into B Movie land with Morgus And The Ghouls’ Morgus The Magnificent, an off the wall oddity that’s not quite Mondo Bizzarro but is approaching the neighbourhood. From there, Lonely Boy (Frankie And Mac) is a fairly average teenage slow drag smoocher, Roland Stone reworks Junko Partner territory in Down The Road and there’s a one-two combo from Big Boy Myles as he revisits the Gary U.S. Bonds New Orleans and invites his girl to (Put On Your Old) Gray Bonnet. Chuck Carbo is Out On A Limb, Gene And Al's Spacemen are back in instrumental territory for Mercy while Ike Clanton needs someone to Show Me The Way (to your heart, of course), another bit of teen romance. Enough said. Better is Bat Carroll’s Aw! Who? which at least has a bit of character to go with the schmaltz, Joe And Ann’s Gee Baby (Baby You're So Fine) is pretty much as you’d expect the title to sound, as is Sugar Boy Crawford’s Have A Little Mercy, though there’s a tad more oomph in the vocal and the backing chorus. Gerri Hall’s I'm The One is another lightweight ballad that doesn’t hit any great heights and The Ends pick things up slightly with It Ain't No Use, Jerry Byrne is pretty much going through the motions when he fears You Told Me You Don't Love Me, Jimmy Donley’s fairly subdued about his Forbidden Love and Big Boy Myles might claim I Still Care but doesn’t seem to be doing much to convince anyone. Ronnie And The Delinquents have a problem with something that Keeps Dragging Me On, Carl Greenstreet rocks out a bit on Hey Mama, Joe And Ann have a slight problem with their Curiosity, Al Reed is checking his dog’s health on Roll Over Rover and a lively run through The Honeydripper Part 2 credited to Mac Rebennack winds things up.